Perfect addition to any celebration. These go fast! Everyone's favorite! Almond flavored with raspberry filling dipped in chocolate. Rainbow Cookies, 1 lb. has been added successfully to your wishlist. You've searched high and low to find that festive little cookie Zayde bought for you at the corner deli when you were a kid. 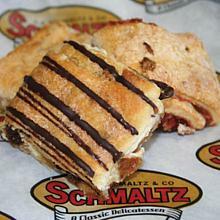 You just couldn't forget those delicious layers of soft pastry with sweet raspberry filling. Dipped in chocolate of course!! You'll receive one pound of our famous rainbow cookies. You might want to order two!! There are currently no reviews for Rainbow Cookies, 1 lb., but you can be the first! 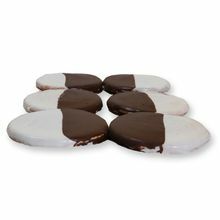 Black and White Cookies Full Size, 2 ct.